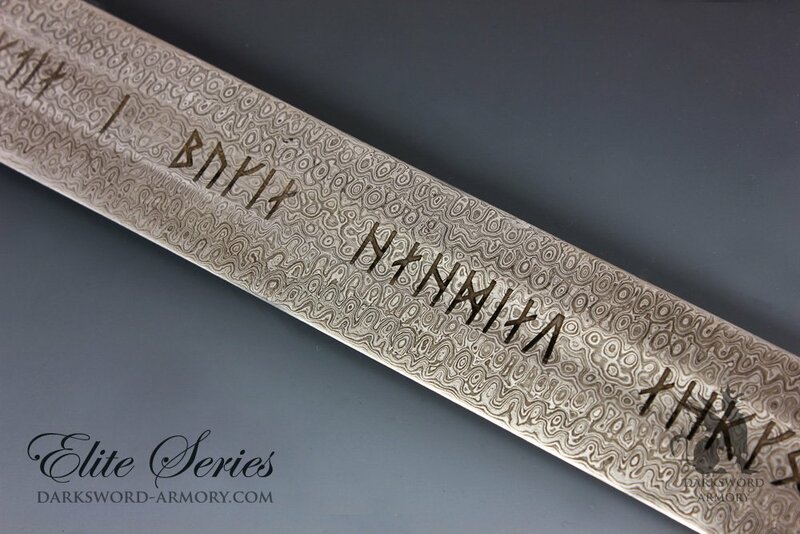 Darksword Armory (DSA) was founded in 1996 by Eyal Azerad, who has been studying Medieval and Renaissance sword making his entire life. 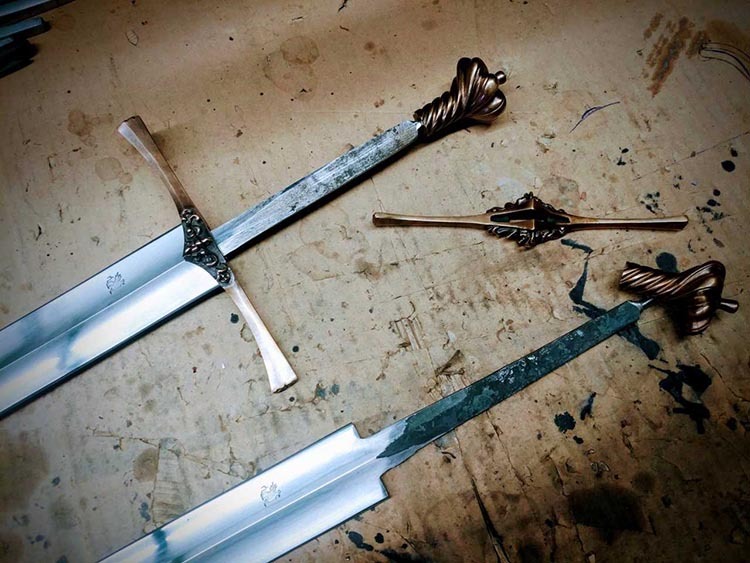 Using a specialized team of 6 smiths, they craft swords based on museum relics, swords in private collections and also based on medieval art. 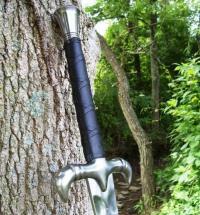 Their swords have a reputation for being nearly indestructible, suitable for stage combat, re-enactment, or cutting if they have been sharpened and the blades are easily among the toughest on the market. Their warranty is a guarantee for one year under normal (re-enactment) use, although this warranty is voided if the blade is sharpened after market. 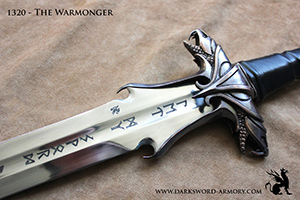 Darksword Armory has 3 galleries of swords covering a wide variety of culture and history. 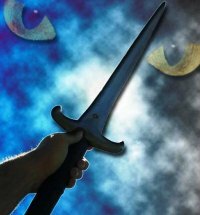 From the Roman spatha and dark ages swords to 15th century 2-handers and everything in between. Prices are typically from $350 to $600 depending on the model (the most expensive ones have solid bronze cast fittings). 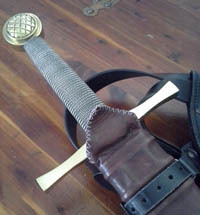 A sharpening service is available for a nominal additional fee, and most of the swords have a scabbard upgrade option for $70 with a high quality leather sword belt and suspension system. 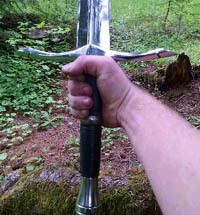 Without a doubt, Darksword Armory are THE go to company for battle ready Fantasy swords inspired by film, TV, fiction and their own wild imagination. 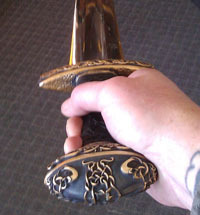 Models include battle ready versions of the Lord of the Rings swords such as the Rangers Sword, Anduril and several others - but also some truly stunning original designs such as the Warmonger (pictured right) loosely based on the Atlantean Sword of Conan the Barbarian, and many other original, fully functional fantasy sword designs. Limited to 100pcs for each model, the Elite Series are a mix of 1095, 5160, L-6 and O1 steel, pattern welded versions of some of their most popular standard series swords such as their Danish Two handed sword, Anduril and the Ranger sword to name a few. Prices are typically around the $1,500 per model. 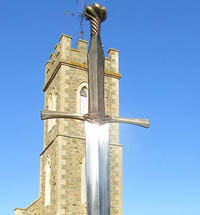 Located in the industrial sector of Dorval (Montreal), Eyal and his team of Smiths individually hand craft each sword using the same techniques as those used in the middle ages, hence hammer and anvil. 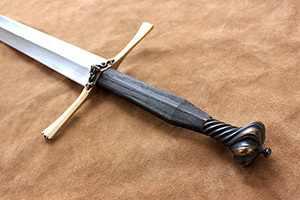 Swords are made from either 1060 or 5160 High Carbon Steel, with the 5160 steel swords dual hardened to produce with a Rockwell of 60 at the edge, and 48-50 at the core. Fittings are mild steel, wood and leather with some of their more ornate and expensive designs featuring cast in solid bronze, and the vast majority are peened for extra strength and durability. 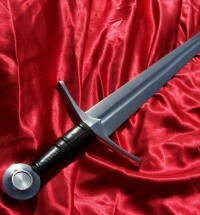 Some years ago Darksword Armory was embroiled in a controversy on the Sword Forum International. Complaints were brought up by a few individuals, words were exchanged, and DSA and Eyal left the table with an injured reputation that lasted for a few years. Recently with their partnership with SBG more light has been shone on this situation. 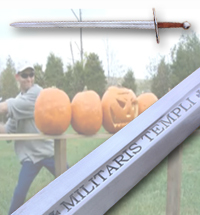 Since then, some controversy has raged on internet sword forums challenging the claim that the swords are actually hand made in Canada. 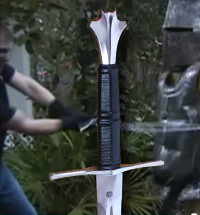 While initially reluctant due to a break in and theft of all materials from the forge many years ago, Darksword eventually responded to this claim releasing several videos documenting the shop and it’s equipment, yet still some protagonists are not satisfied. The most recent controversy has had to do with their tangs - and it is true that older models were a bit on the thin side, but were within historical tolerances. The main issue may actually have been one of modern demands for more robust tangs as standard, so in response they have beefed up their tangs - and are showing pictures of the tangs on their site - something no other sword manufacturer has had to do. 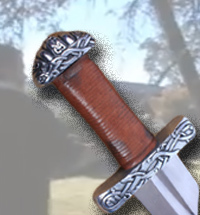 Yet despite all this, vicious rumors still persist..
All controversies aside, the swords themselves may have some grind marks, hammer marks, blade misalignment or other cosmetic defects that do not truly effect performance – however the most common complaint currently is to do with their sharpening service. 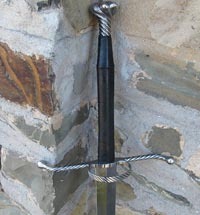 By default, Darksword Armory swords come unsharpened, however the in-house sharpening service is considered by many sword enthusiasts as rudimentary at best to totally ineffective at its worst and often requires additional sharpening to be able to cut standard lightweight targets such as water filled bottles, tatami, etc. Prices at SBG are slightly lower than elsewhere due to free shipping and the application of an improved sharpening service (which is still not perfect, but a lot better than what it was previously) at no additional charge, plus reduced rates on the upgraded scabbard option, which comes as standard at SBG.